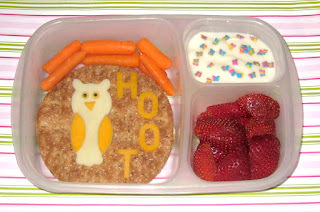 BentoLunch.net - What's for lunch at our house: An Owl Bento for My Sweet Girl! An Owl Bento for My Sweet Girl! Faith had her math competition today and needed to bring a lunch with her. I was going to attempt to come up with a math theme to her bento, but apparently I have no number cutters and it was too late to get creative with the letters and attempt to turn them into numbers. So I went with an owl. Owls are smart. And so is my girl! She came in 5th out of all the fourth graders in the individual competition (each school picks their top 5 to send, and there are 8 elementary schools in our district). Faith has a peppered turkey and cheese sandwich on whole wheat rounds, topped with a very smart owl. The owl is made from provolone, with cheddar accents, and some cucumber bits to make his eyes. "Hoot" is also made from cheddar. To go with her sandwich, she has carrots, strawberries and vanilla yogurt with butterfly sprinkles. Adorable, and big congrats to Faith! How exciting!